This is another one of those “come up with something to get rid of stuff” meals. My pork chops were defrosting and I had some gorgonzola cheese to use up. So, I immediately reached for the dried mission figs in my pantry (yep, you guessed it – Trader Joe’s) and came up with one of the simplest dishes ever. And the taste, well, is far from simple. The amount of time needed in the skillet will vary, depending on the size of your pork chops. As you’ll see, there’s no pan sauce here, and as long as you don’t overcook your meat there’s definitely no need for one. They’re juicy and delicious all on their own. You could easily sub lots of things for the stuffing…it’s all about what you have in the house. Be creative! Just remember that you may need to add spices or other extras if your ingredients are more bland than what I used. Mine were so powerful, I needed nothing else. Slit pork chops horizontally through the middle, about 3/4 of the way through, creating a pocket. Season both sides of chops with salt and pepper. Mix figs and cheese together in a bowl, then divide mixture evenly among each chop. Pack it in as far as you can to keep mixture from falling out. Heat oil in a large pan over medium high heat. Place chops in and leave on each side for approximately 5-7 minutes (time will vary depending on thickness). DO NOT overcook! Remove chops carefully from pan and serve immediately. 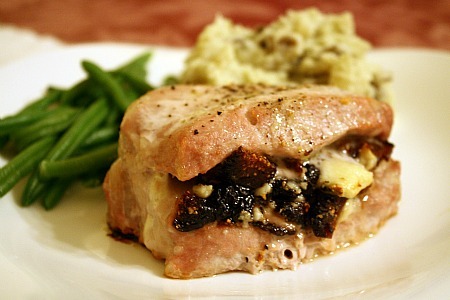 This entry was posted in gorgonzola, main dishes, pork, QuickAndEasy. Bookmark the permalink. These sound soooo flavorful. I love the sweetness of fruit with that rich, bold flavor of cheese. Delicious! If any two things were ever meant for each other, it’s figs and gorgonzola! What a delicious stuffing! What a fabulous meal. Great idea. Thanks for the inspiration! I ended up using goat cheese and dried cranberries. Such a simple method, but such a flavorful dinner!